The government wants the nation’s banks to revalue their stakes in the Banca d’Italia. It says the move addresses a conflict created by banks owning central bank shares, but the deal would look more like a tax grab by a cash-strapped treasury, and a mini-bailout for the banks. 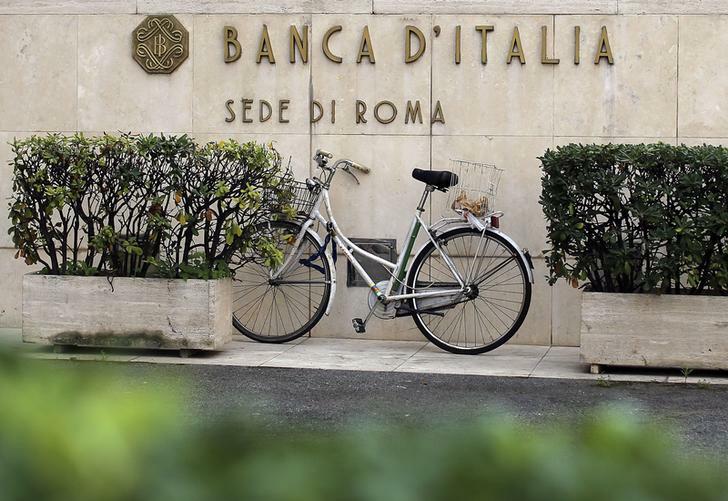 A bicycle is parked in front of a Bank of Italy sign in Rome October 31, 2013. The Italian government is considering reforming the Bank of Italy’s ownership and capital base. The central bank is owned by Italy’s lenders, with Intesa Sanpaolo ISP.MI and UniCredit owing 30 percent and 22 percent respectively. A report published on Nov. 9 by the Banca d’Italia and Ministry of the Economy and Finance said the shareholder structure should be reformed to avoid the perception that the central bank might be unduly influenced by its shareholders, to preserve its independence and clarify shareholders’ economic rights. The report assumed a value for the stakes of 5-7 billion euros, derived from a two-stage dividend discount model, estimating the present value of future payments from the bank’s ordinary and extraordinary reserves. “No concrete problems have emerged, thanks to the limits to shareholders’ rights, but it is necessary to avoid possible (wrong) perceptions that the Bank of Italy could be influenced by its largest shareholders,” the report said.